This was one of my favorite animated movies since Tangled, which was released in 2010. The characters and themes were very relatable. 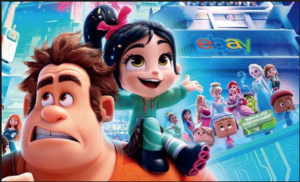 The movie started with Ralph and Vanellope talking about what they wanted out of life. The conversation involved topics like monotony regarding one’s job, wanting variety and excitement, following one’s dreams, and wanting stability and how that can mean having to sacrifice certain things. I thought this struggle with stability versus variety is very applicable to people’s lives nowadays. 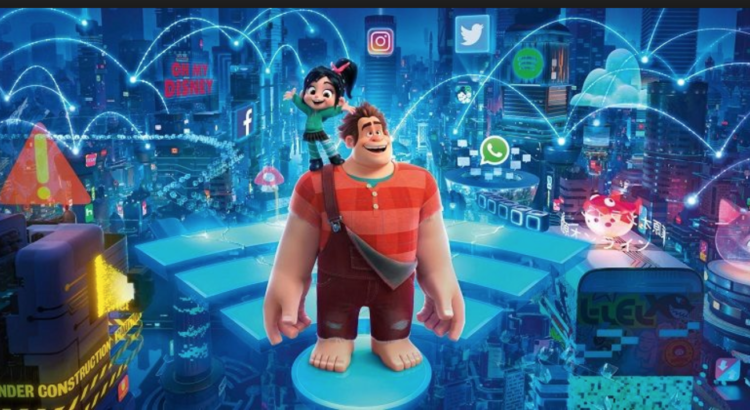 There were other elements in the movie that resonated with me: Vanellope’s glitching was analogous to anxiety which I thought was helpful and educational in terms of explaining mental health to children. 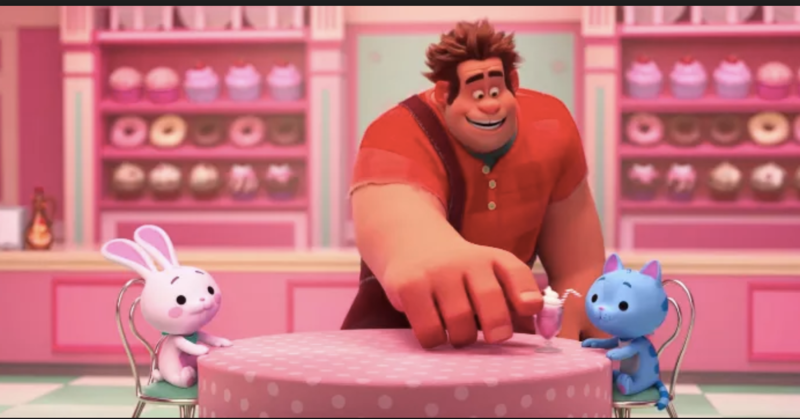 Ralph started out being really clingy but eventually learned that he needed to give Vanellope space in order for them to have a healthy friendship. The big take-home message at the end of the movie was that healthy friendships don’t end even with physical distance. I also liked the fact that the movie taught people that your biggest enemy is yourself and your insecurities. 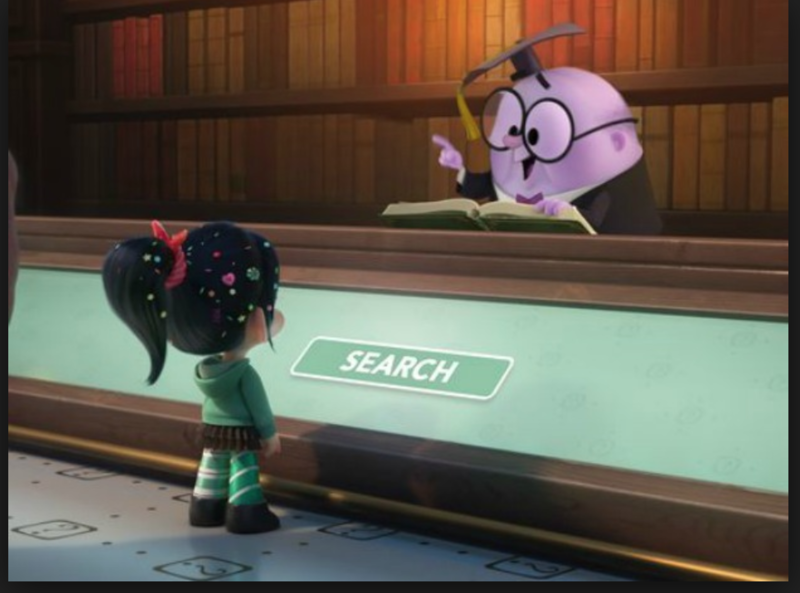 Vanellope’s insecurities temporarily broke the game Slaughter Race. Ralph’s insecurities created a horrifying monster which broke the internet. 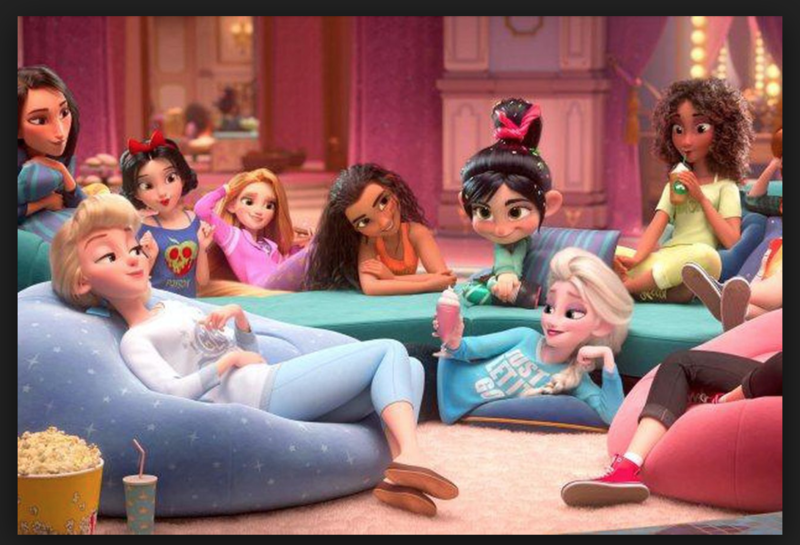 Above all, I loved that other Disney characters showed up in the movie: all the princesses, Eeyore from Winnie the Pooh, Stormtroopers from Star Wars, etc. The scene when Vanellope met all the princesses and got interrogated was one of my favorites. 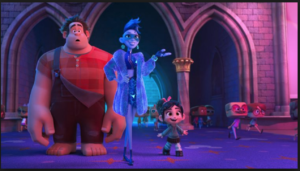 To figure out if Vanellope is a true princess, the other princesses asked her if she had been cursed, kidnapped, poisoned, or if she had any magical animal companions— which all the traditional princesses had. The movie parodied the Disney princess trope and even pointed out elements that I have never noticed. 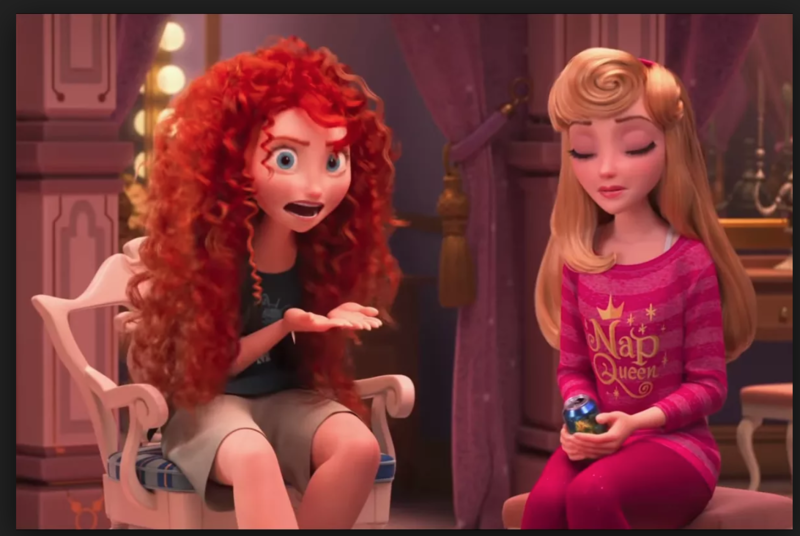 For example, I never realized that most of the princesses stare at some body of water while singing about their hopes and dreams: Moana stares at the ocean, Mulan stares at a water trough, Cinderella stares into a well, etc. In a later scene, Vanellope stared into a puddle created from a spilled beverage while deciding what she wanted out of her life. And since each Disney princess had their own song, Vanellope had to sing a song too: A Place Called Slaughter Race. Her dream of living in the game Slaughter Race was very unconventional for a princess. The place had a high crime rate, and it was dirty and terrifying. But it was everything Vanellope wanted because of her desire to race and to have a sense of variety in her life. There was another scene with the princesses that I enjoyed. At one point, they all get into more comfortable and modern clothes. Each of their outfits and the quote on their t-shirts reflected their characteristics which I thought was super clever. 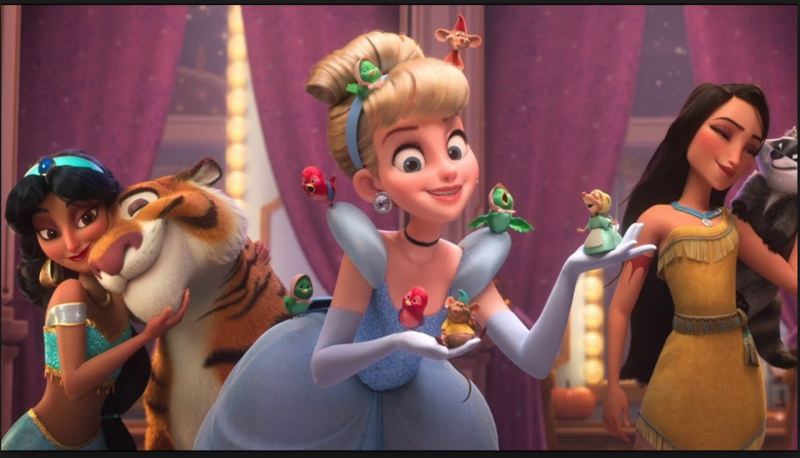 I really enjoyed seeing each of the princesses in a unique context but still maintained their personalities. 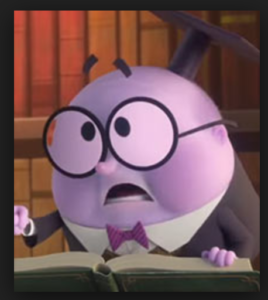 And since I can’t resist sharing, my favorite character was Knowsmore, who is the personification of a search engine. His mannerisms were simply hilarious. I agree that the after credits scene was really funny, but only because I enjoy dark humor. It was a little scary and I was surprised they included it at the end. I saw the movie because I enjoyed internet references, I enjoyed the princess scenes, the ebay scenes and all the little internet jokes. But the movie as a whole I thought was overly gushy and boring. The best part in every cartoon movie is the villain character, including King Candy from Wreck it Ralph, this movie had no antagonist. 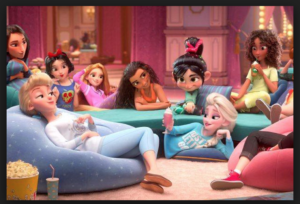 I appreciate your analysis of how the biggest enemy of kids in our generation is ourselves and our insecurities, but it made for a boring movie. I never related Vanellope’s glitching to anxiety until reading your post.